Most travelers visit the must-see sights in Phnom Penh in a couple of days then head off to their next destination. We think this is a big mistake! Although the Royal Palace, Tuol Sleng Genocide Museum, Choeung Ek Killing fields and National Museum are all important and interesting sights to visit to understand Cambodian history and culture, they won’t give you a complete picture of this complex, vibrant city on the rise. To further immerse yourself in Cambodia’s capital, read on for our top recommendations for off the beaten track things to do in Phnom Penh. A majority of Cambodians do their grocery shopping at outdoor markets all over the city. The best times to visit these markets are in the early morning (6:30-10am) or late afternoon (4:30-8pm). There are usually two shifts of sellers who set up their produce in the same spot every day. Some sellers have more permanent stalls with shade and may stay in their spot for 10-16 hours! We usually do our vegetable and fruit shopping on Street 440, behind the Russian Market (Tuol Tom Poung), close to our home. Although by day the Russian Market is a busy tourist spot where travelers come to bargain over anything from Angkor Beer shirts to imitation antique opium pipes, the neighborhood is still very Cambodian. After the Russian Market closes and the tourists head out for happy hour, the local food market is just waking up for the evening. Make your way to the north side of the Russian Market along Street 440 and check out the vast spread of local produce and meats on offer. The chaos of pedestrians, bicycles and motorbikes weaving between the crowded stalls spilling into the street will give you a good idea of the daily shopping routine of the neighborhood’s locals. Sisters working at the local outdoor market near the Russian Market in Phnom Penh. After scoping out the outdoor market you’ll be just in time to eat at one of the best seafood barbecue restaurants in town. During the day this space on Street 450 is used as motorbike and bicycle parking for Russian Market customers. In the evening it is transformed into an extremely popular seafood barbeque restaurant. Every night of the week starting at 5:30pm tables and chairs are set up, hot coals heat the street-side grills, and the restaurant fills with locals eating fried oysters, shrimp, squid, crab, even sting ray! The food is delicious and inexpensive. We typically spend under $5 each to eat our fill, plus have an Angkor beer or two. The restaurant is on Street 450 between Street 155 and Street 163, connected to the Russian market. There are a few restaurants sets up in the area, but this is the biggest one closer to Street 155. Bonus tip: Just down the block on the corner of Street 450 and Street 163 is an ice cream stall called The Snacker. They make all of their dairy-free ice creams and sorbets using locally sourced fruits. At just 1500 Riel (33 cents) per scoop, it’s the perfect dessert! 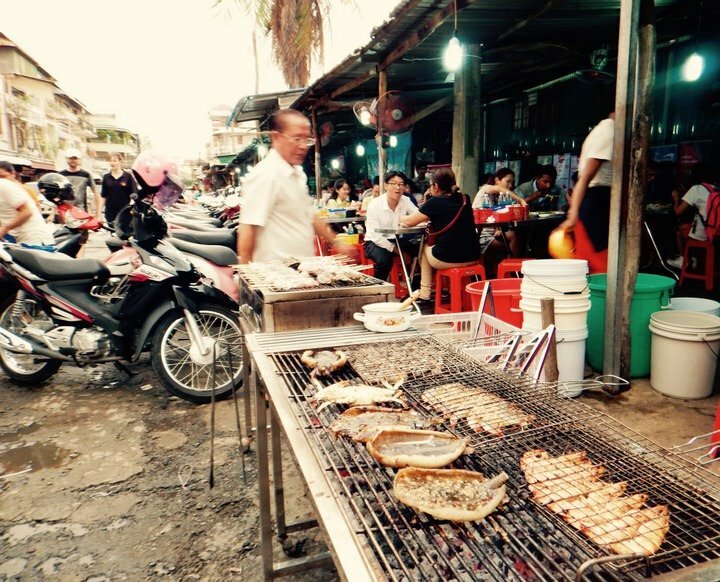 Sting ray, crabs and squid getting grilled up outside the popular seafood BBQ spot at Tuol Tom Poung. Phnom Penh is a bustling city from dawn until late night. The streets are packed with motorbikes, tuk tuks and trucks, and every day more expensive imported cars are joining in the congestion, kicking up dust and choking intersections with traffic. Few travelers know that just across the Mekong River, only 20 minutes from the Riverside, lies peaceful Kandal Province. You can ride a local ferry across the Mekong River for only 500 Riel (12 cents) and find yourself in villages amongst fruit farms, cows and rice paddies in a matter of minutes. Multiple ferries run every 5-10 minutes from the Phnom Penh-Areykhsath Ferry Dock located near Naga World shopping center. For more freedom and to get further off the beaten path, rent a bicycle or motorbike near the Riverside and take it across the ferry. Be brave (and careful!) when you join in the traffic on the way to the ferry. 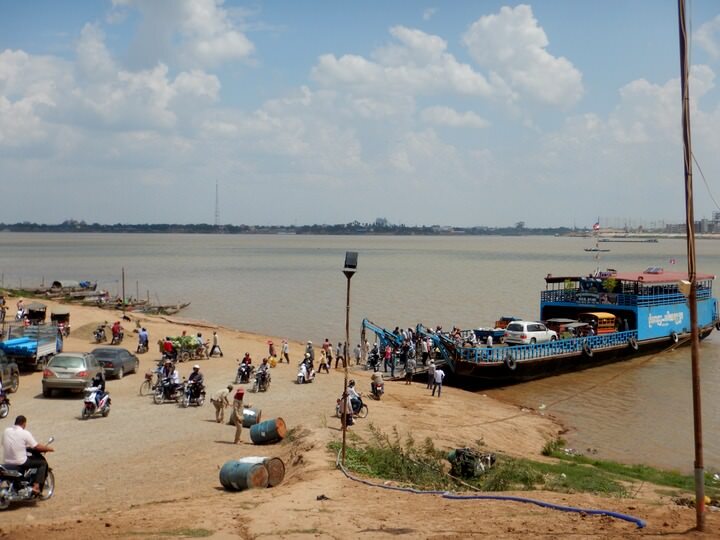 Every day thousands of people cross the Mekong river between Kandal province and Phnom Penh. The Central Market and Russian Market are great spots to shop for souvenirs, however they are also heavily geared toward tourists. If you want to experience a large local market in a different part of the city, head to Boeung Keng Kang Market, located between Street 380 and Street 392. You can find just about anything there from clothes, shoes, household appliances, bedding, phones, produce, meat, it’s all there! 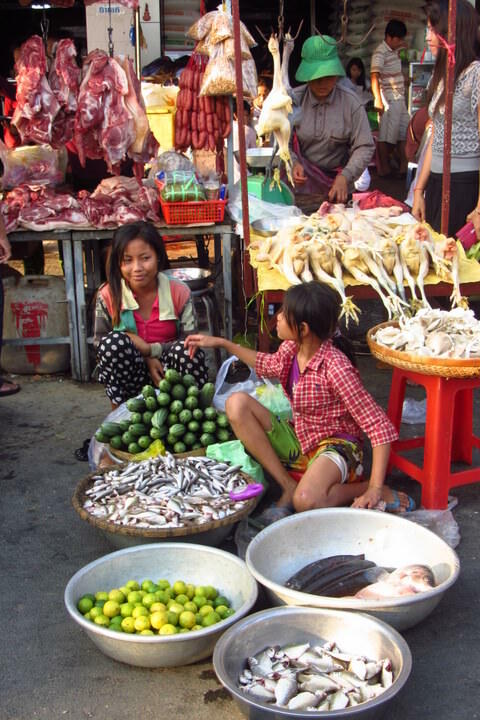 The market is also a great place to practice Khmer phrases you’ve been learning as fewer sellers there speak English. This small entrance leads to a wide world of shopping possibilities. For a unique souvenir from your Cambodia travels head to a local wedding photo shop for shots in traditional Cambodian clothing. 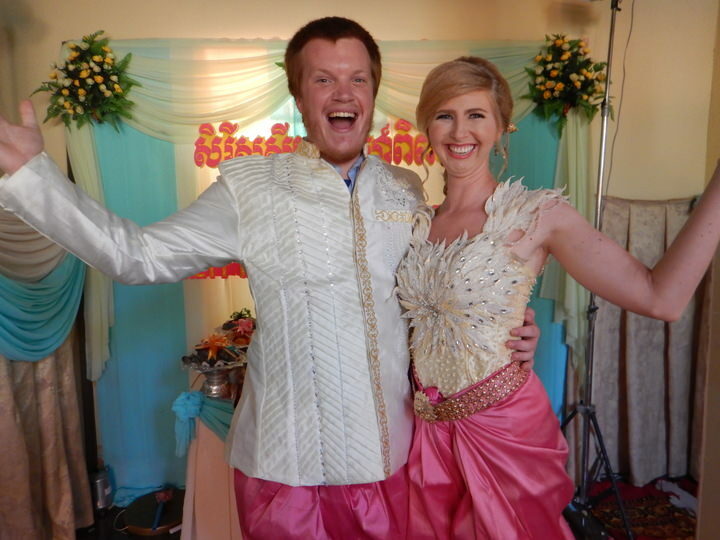 One of our favorite experiences in Cambodia was dressing up in traditional Khmer clothes and taking part in a friend’s Cambodian wedding in 2014. Although you may not be getting married or going to a wedding, you can still have fun trying out Cambodian wedding fashion! There are wedding photos shops all over the city, but we recommend Heng Heng Photo Studio located at #152Eo Monireth Street, near Mao Tse Toung Blvd. They charge $10 per person per outfit, including hair, make-up and three poses. Be sure to go in or call ahead to reserve a time for your photo session. It’s quite a deal for an unforgettable memory! One of the six outfits we wore during our friend’s Cambodian wedding in 2014. Honestly, just let the make-up stylist do their thing. You could get amazing results, like Jen’s eyebrows! The stand-up comedy scene in Cambodia, and all over Asia, is growing quickly, and Stevo has loved being a part of it. Seeing a comedy show abroad is a unique way to gain insight into the culture and goings-on in the country from local and expat perspectives. It’s also a fun way to spend an evening and meet some great people! There is at least one comedy show going on every week at different locations around Phnom Penh. Check out www.facebook.com/comedyclubcambodia for the latest info. Vatthina Tola, Khmer English-speaking stand-up comedian. This list only scratches the surface of all there is to do in Phnom Penh. For better or worse, change and growth are happening fast. Spend some extra time here to get to know Phnom Penh as it is now. We promise it’ll be worth it. 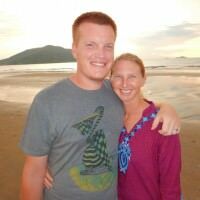 Jen and Stevo are the California couple behind Two Can Travel, a website about living, working and traveling in Asia. Since 2011 the pair have worked as English teachers in China, volunteered in the Cambodian countryside, and traveled throughout Asia, documenting their (mis)adventures along the way. Their aim is to provide stories, info and advice for those seeking an alternative lifestyle in Asia. Follow Two Can Travel on Facebook, Twitter, and Youtube. 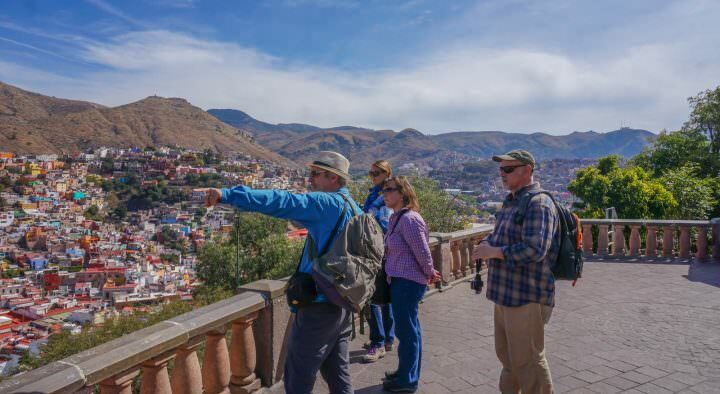 What a great list of things to do and explore! I think this is really the key in Cambodia. 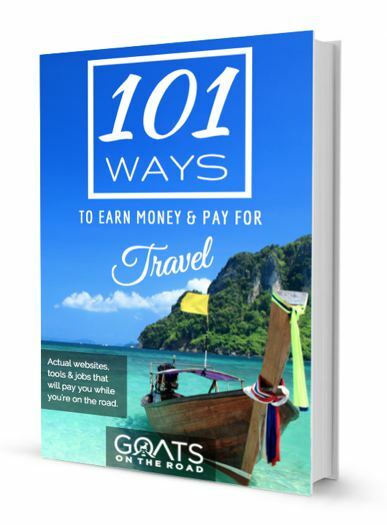 When I was “on the Tourist Trail” I didn’t have the ideal time in Cambodia, but once I started spending time off the beaten path with people who knew the area well, it was a different story! Really fab list of things I hadn’t considered adding to our itinerary for Phnom Penh – which language are the comedy shows generally in? That’s such a brilliant idea for gaining a new perspective from expats and others living in the area!! The comedy shows are in English as a majority of the comedians are expats. 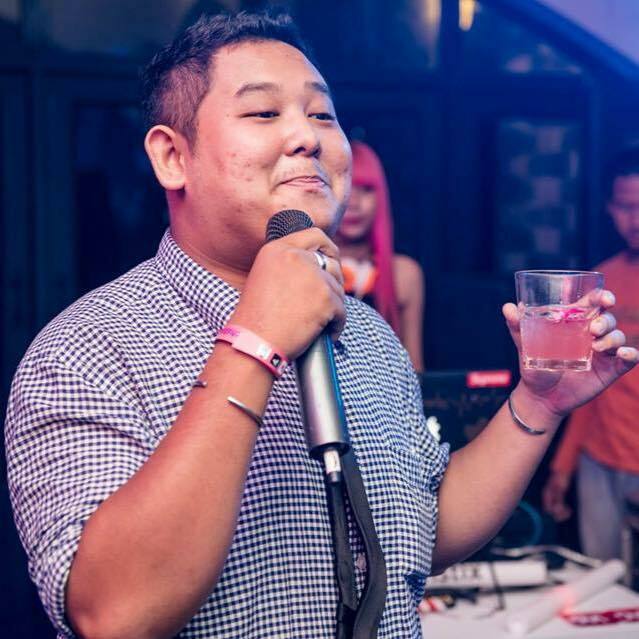 Cambodian-style comedy is really different from western stand-up. It’s more or of a Vaudeville style of witty banter and slap-stick, and is popular at events like weddings. Really cool to see also! This is why reading travel blogs can be fun. 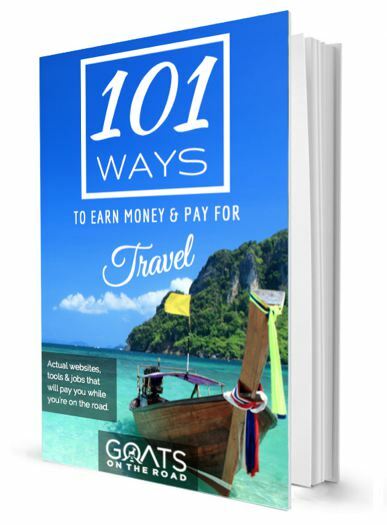 I would’ve never thought about this particular place for a trip but now I’m intrigued and got some great insight on where to go. Love the pics! Thank you Tawanna! Hope you can travel to Cambodia soon. It is developing quickly and now is a great time to visit! Yay, I love this post guys! I definitely want to go to Kandal Province. You’re right…even after living in Phnom Penh for two months it has never dawned on me to go across the river! Ugh, I’m still not braving enough to rent a bicycle or motorbike though!! The wedding clothes photo op is inspired! Great tips. haha, ya, it’s pretty awesome! 5 dollars for a big plate of seafood sounds great to me. Great tips. Thanks for sharing these great insider tips! While we’re always big fans of local markets and street food vendors, the ability to try on different Cambodian wedding attire is new to me. Sounds like a fun and unusual way to live like a local! I’ve heard Phnom Penh is definitely a must to visit, but haven’t heard about what to see specifically. 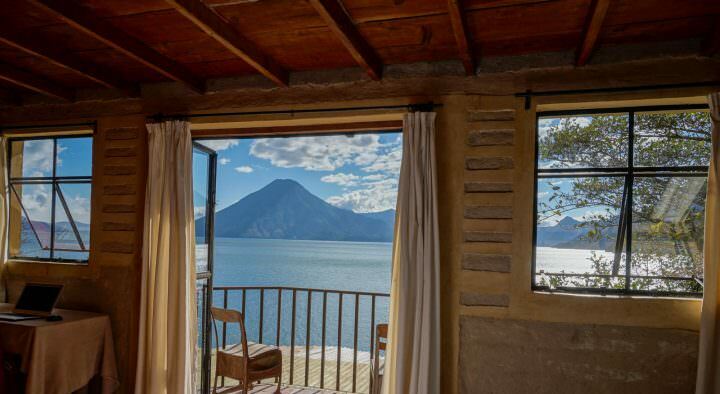 I’m glad I stumbled on this post first to see what there is beyond touristy destinations rather than hearing about all of the touristy stuff first. I’m glad you mentioned a market that is also for locals and not just filled with tourists. It’s always more intriguing to see how people in the area live and where they like to go. Absolutely Brooke! We love Phnom Penh! 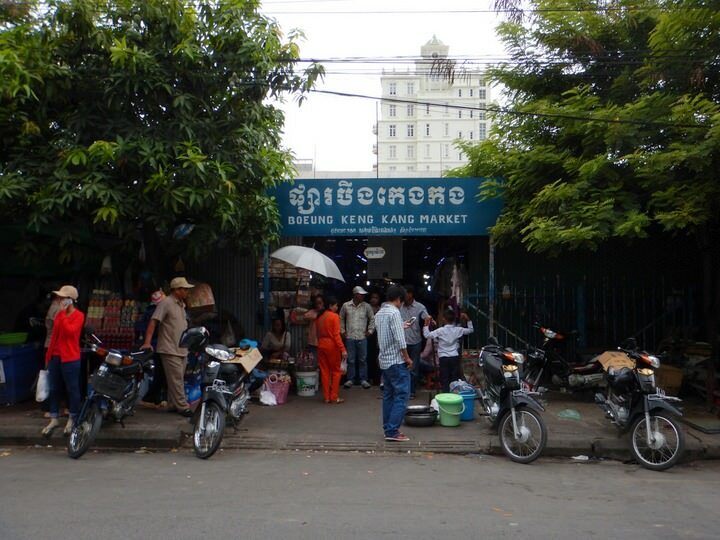 Boeung Keng Kang Market is a great place to see locals doing their daily grocery shopping, visiting fortune tellers, and buying clothes and household items. You can find some great items for yourself there as well! 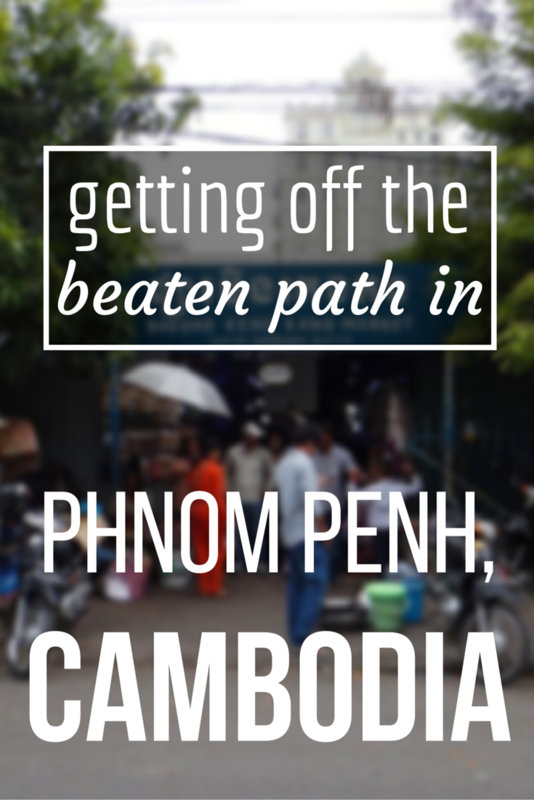 Love these suggestions for Phnom Penh – very helpful since I haven’t been there yet. I think perhaps one of my first stops will be at a comedy club. Great idea! A friend of mine has lived in Phnom Penh and I’m always interested in the stories she has to tell. thanks for the post! i will be going there in this coming Feb and quite worried where to go. Is it easy to find a hostel there? and if let say we wanted to try out their farming or feed the cows or anithing like that ,is it possible to do that ? Finding hostels in PP is definitely easy to do. I’m not sure where you want to feed the cows though? I’m sure if you asked someone though, they could point you in the right direction! This post has some amazing suggestions. Thank you. I’m moving there in mid June to teach English and your posts have given me a better idea on what to expect.